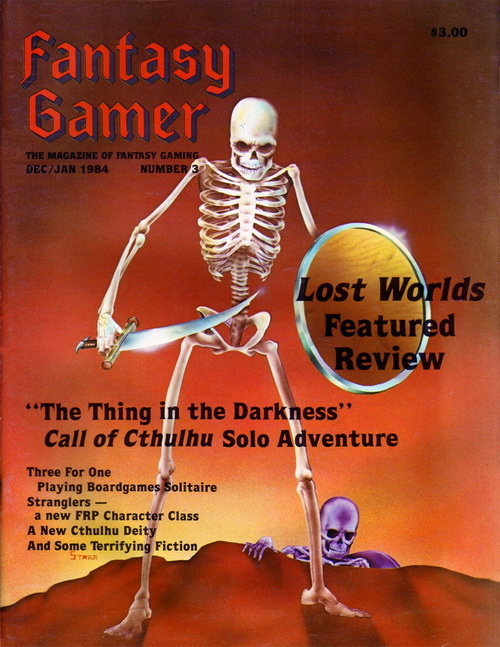 Are you terrified by Fantasy Gamer #3 (cover date December 1983-January 1984)? You should be; it's scary how fun this issue is! In addition to the regular game reviews, news, and letters, this issue features "The Thing in the Darkness," a 19-page solo adventure designed for Call of Cthulhu (with guidelines for converting to other games). Can you solve the mystery of the missing girl – with your body and soul intact? 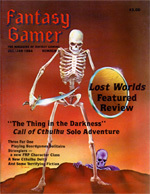 This issue also includes a meaty short story – "Mirrors of the Soul" – about a private eye facing the forces of darkness; guidelines on how to turn two-player games into solo experiences; the strangler class for Dungeons & Dragons; an in-depth review by Steve Jackson of the Lost Worlds one-on-one fighting books; and more.